Recognizing this need, Yvette Quantz, RDN, LDN, will join Lesli Bitel, MBA, RD for a special edition of the Coaches Café on April 27, 2017 Thursday at 9:30 AM CST (10:30 AM EST), as a fellow NECoach of the Nutrition Entrepreneurs DPG to throw light on various aspects of effective email marketing. The special edition is open only to members of Nutrition Entrepreneurs DPG. As a nutritionist, registered dietitian or a health coach, it is crucial for you to engage and reach out to your customers with effortless direct marketing. Speaking on the topic, Yvette will shed light on important tips to grow and engage your target audience through effective and powerful email marketing. Yvette is the founder of Customized Nutrition Newsletters, a dynamic and done-for- youemail marketing program exclusively for dieticians and nutritionists. 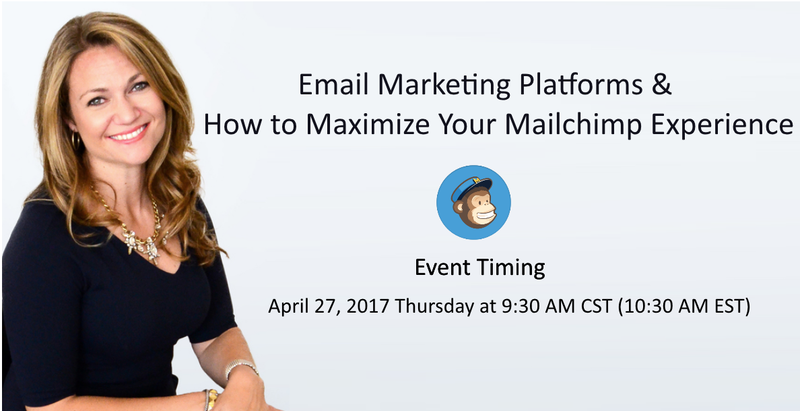 It is a great opportunity for members of Nutrition Entrepreneurs DPG to share ideas and views and connect with their colleagues in this highly interactive, hands on workshop where Yvette and Leslie will discuss email marketing platforms and will demonstrate how to maximize your MailChimp experience. The Nutrition Entrepreneurs Dietetic Practice Group (DPG) is an engaging networking group of the Academy of Nutrition and Dietetics (formerly the American Dietetic Association). Nutrition Entrepreneurs DPG brings together enthusiastic and diverse group of dietitian nutritionists professionals who are authors, speakers, corporate health coaches, media consultants and more. NEDPG aims to empower its members to build a successful nutrition business and achieve professional excellence with the right resources and networking opportunities.